Although LG has been in the laptop business for years, the Korean electronics firm has never brought their notebooks stateside. That is until now. 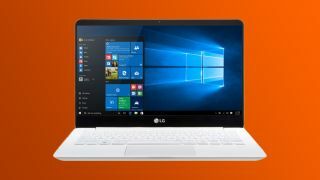 LG has announced its ultralight weight Gram laptop will be available in the US for the first time through Amazon and Microsoft Stores. Coming in at 2.16 pounds for both the 13-inch and 14-inch models (you read that right), the LG Gram is lighter than the 13-inch MacBook Air while rivaling the Lenovo LaVie Z 360. Both models also come sporting a 2.2GHz Intel Core i5-5200U processor, 8GB of ram and 128GB of SSD storage to start with the 13-inch going for $899 (about £593, AU$1,285) and the 14-inch for $999 (about £659, AU$1,428). There's also the option to pick up a beefed up 14-inch rig with an Intel Core i7-5500U chip and a 256GB SSD for $1,399 (about £923, AU$2,001). Overall both machines are really nice half-inch thick packages with a carbon and lithium magnesium blend body. The full HD, 1920 x 1080 screen on either model are also nearly bezel-less on the sides. So far, the only short coming seems to be battery life, which LG promises to be 7.5 hours, but there had to be trade offs somewhere when these machines so incredibly light. Both the 13-inch and 14-inch LG Gram will be available start right now in the US. Unfortunately LG has not announced any plans to release the Gram in the UK and Australia.